Please fill out the Name, and email (if you have one) boxes. Section No and Date are filled out automatically. Please read each paragraph carefully, and answer the questions correctly, and write short responses in the space provided. The radius of the earth’s orbit is approximately 150,000,000 kilometers. What is this number in scientific notation? Enrichment: (1) This represents the orbit of Earth around the Sun. When the Earth is in the leftmost position, it's the 1st day of Winter. 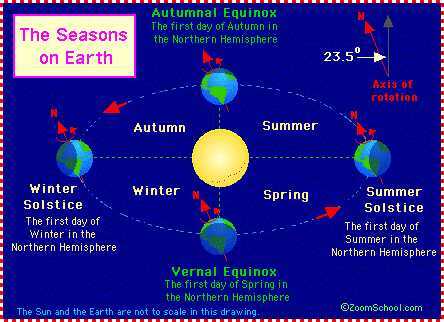 Directly above and below the sun, are the Fall and Spring seasons. (2) Artists throughout the ages have received inspiration from natural phenomenon taking place in the world around them. Italian composer and violinist, Antonio Vivaldi, used the Earth's seasonal relationship to the Sun as inspiration for his masterpiece "The Four Seasons" which consists of four violin concertos, each inspired by a different season. Listen to an excerpt from each of the concertos. .. Click the buttons above. Listen for the chirping of birds and the fluttering of their wings to identify Spring. Listen for thunderstorms that frequently spoil outdoor activities on hot Summer days. Music Festivals after the Fall harvest. Winter's bleak, icy weather can make you want to run for shelter ... .
3 Speed Reading Comprehension Quiz. You are given a worksheet of sentences to complete, then the answers are displayed for you to complete the worksheet and memorize it. Then you are given the sentences, one-at-a-time, to complete, in 10 seconds or less. You are graded, and need 80% to pass. A "Flash Card" approach of Math Facts. Learn by repetition and immediate recall. 1 1.73 = 1.73 x ____. Number raised to 0 power = itself! 3 173 = 1.73 x ____. Hundred. 4 1,730 = 1.73 x ____. Thousand. 5 17,300 = 1.73 x ____. Ten Thousand. 6 173,000 = 1.73 x ____. Hundred Thousand. 7 1,730,000 = 1.73 x ____. Million. 8 17,300,000 = 1.73 x ____. Ten Million. 9 173,000,000 = 1.73 x ____. Hundred Million. 10 1,730,000,000 = 1.73 x ____. Billion. If necessary, there are 4 computer-based quizzes on Scientific Notation that you may take. These are Timed Speed-Reading Comprehension Quizzes that you can retake as many times as needed to learn the concept and pass the quiz! Click here for "Flash Card" Quizzes! And you've got to get the vocabulary ... so here we go .. scroll down this list at your own speed to learn these words"
The Broadband technologies (cable, ADSL, Dvbt, satellite, power LINE) convey digital data in substantially higher data transmission rates than Narrowband (narrow-band) to connections. 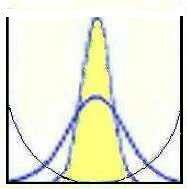 The narrow-band transmission technologies limit the use of the Internet mostly to text and fixed images. Broadband makes a better rendition quality in real time of moving picture films, music, etc, and a faster Download of these contents. In addition, a rendition of whole films and Live Events (press conferences, concerts) in streaming mode is possible for the first time. With wide-band transmission technologies, a versatile offering of interactive services (contents and applications) is possible, e.g. : High speed Internet streamed content Live and on demand (video on demand, etc); downloads of extensive files (Movies, video, Game Environments among other things); also On-line Entertainment, Digital television (Free TV/Pay TV), Digital interactive television, (the connection of television contents with purchase - service and information channels). Cell phones and wireless laptops require a broadband transmitter and receiver (wireless PC card). LATTC is planning to provide wireless access. Watching a streaming video (it plays as it downloads) requires narrowband / broadband technology (choose one). Using broadband and the best of the Web's abilities, the new tools have the potential to inspire teachers and students and to get them deeply engaged in their subjects. 'Cable in the Classroom' is inviting educators to explore the new tools, such as handheld digital video cameras, a server to host their files, a range of devices such as workstations, laptops, palmtops, PDAs, and iPODS down load content to, by wire or wirelessly, directly from the Web, or transferred to devices by firewire or wireless Bluetooth connections. Project Cam: Premiering fall 2005 and in search of classroom users, uses Webcams and broadband access to bring students from different cities 'face to face' on the Web to work on projects together. Each project has access to its own secure Web page; live Webcams feeds with audio from each location; live chat capability; and classroom-to-classroom file sharing. The expected educational benefits include learning to work in teams, exposure to diverse people and communities, and experience with interactive technology. High school students from Montana and Massachusetts collaborate on an astronomy project, using celestial observations from their different slices of sky to test hypotheses about planetary movements. Spend some time browsing around this site for ideas. CIC is a non-profit educational foundation that is funded by the cable telecommunications industry. Look on the CIC website under "Publications". CIC publishes two (2) journals. One is named Access Learning. Broadband Learning. Live Internet Broadcasting (cybercasting) is the easiest and most inexpensive way to stream audio and video content to the world. Live streaming gives the content creator hands-on control over the production. You can encode the stream at the studio and send one source for distribution. Concurrent with the advent of the Cybercafe and Internet Radio Station are the handheld instruments to 'connect' to them, access them wirelessly, anywhere, anytime! The Apple iPod, a portable and handheld digital electronic devices for recording, organizing, transmitting, manipulating, and reviewing text, data, audio, image, and video files from Podcasts is shown. The iPOD when hooked up to iTunes uses an "Auto Sync" feature that downloads and automatically updates your playlist. The organization of files on the iPOD is handled automatically ('auto-synced'). "With iTunes 4.9 you can now browse, find, sample and subscribe to thousands of free podcasts — radio shows delivered over the Internet to your computer — then _____ them to your iPod and listen anytime, anywhere." The iPOD is the Pioneer device for the fast-coming BroadBand Learning world: Already it will play speeches, display text, and play Video, repeat Video, (coming soon!) The 20MB iPOD 'charms' students into the CyberCentury using Songs! Bringing along with it, Cyber Learning Tools such as a 20MB Hard Drives, Firewire & USB connections, ability to store and play text information, play 'podcasts' which are audio recording posted online, much like a short radio show. The Real Fun and The beauty of a podcast is you listen to it whenever you like. There are more than 7,000 podcasts 'on the air' right now, on every conceivable topic. Anyone can make one with a microphone, a sound-recording program, and the tutorials that have already on the Web, including www.apple.com/podcasting.... Podcasts, in other words, are the audio version of blogs. (macnewsworld). Audio, Video, Music, or Text can be 'synced' (downloaded and organized) to the iPOD U2. If the resources and training were provided by the college, and given that the iPOD can Play Recorded Lectures, Display Text, and Play videos, in what ways can you envision using these features to extend and optimize teaching your students? Write at least one paragraph explaining exactly how you would use this technology to deliver instruction to your students who had iPODS or similar devices. What would you put into Text? What would you record on audio? What would you make a video of? This is about 'brainstorming' how you would make use of this technology if you had a grant! After answer questions, Press the 'Submit' button to automatically post your work, and you will be granted appropriate credit.